A former Governor of Anambra State, Chief Chukwuemeka Ezeife, Friday, warned that Nigeria might be heading towards extinction if the country is not urgently restructured. He said the northern region stands to feel the pain if the nation eventually breaks apart. He made this remark in Benin City at the 20th Professor Wole Soyinka annual lecture series organized by the National Association of Seadogs on Friday. 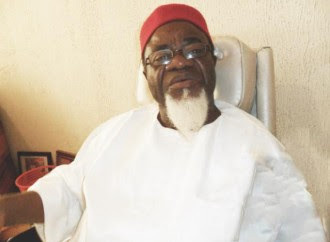 Ezeife noted that only restructuring would free Nigeria from the plot by the British government to keep the country underdeveloped. He urged Acting President Yemi Osinbajo to convoke a conference that would discuss the country. “Every honest Nigerian knows we are at the brink of extinction. Nigeria will cease to exist if we do not restructure. It is a joke for people to think we should not restructure. “Northerners will loose most from the disintegration of Nigeria. We need to go back to the agreed Nigeria. Make the six zones federating units. Allow states in the zones to develop their own constitution.